I remember when my mom had an 8-track deck in her car. That was cool, but you had to deal with the clunky 8-track CLICK multiple times a tape. We really moved up in the world when we got a car with a cassette player. Did you know that they were still making cars with cassette decks in them until now? And oddly, the last cars that had them were Lexus models. 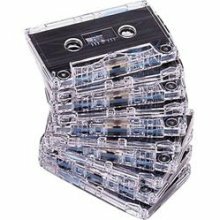 I love CDs and MP3s, but I do feel like you got so much more down and dirty with cassettes. Fixing them with a pencil when they unrolled. Making mix tapes. Shoeboxes full of tapes. Cassingles. What are your favorite cassette tape memories? Hi speed dubbing to copy my friends' tapes and sitting by the radio waiting to press record really fast to swipe from the radio. Cassettes are pretty thoroughly intertwined with my college newspaper days, struggling to stay awake at 3 a.m. the day before press listening to someone's scratcy, bootleged version of some album by Crowded House. I had a bunch of mix tapes that were so popular they actually got me invited to parties ("come to my apartment Friday night, and bring your mix tapes"). I'd like to say it had something to do with my musical tastes but it was mostly because my dad ran a middle-of-the-road radio station (it's now called "adult contemporary") and brought home all of the rock albums that labels sent him that didn't fit the format, and that provided the fodder for the tapes. I was something of a cassette tape geek, having mastered the art of tape splicing (now *that's* a lost art!). I also transferred several favorite tapes in worn-out casings to new ones that you could buy at Radio Shack. I obsessively cleaned my tape deck, running a cleaner cassette on it weekly. I played to many tapes on it that the head eventually wore down.